The Game Bakers’ second IP sees the return of their flair for captivating visuals. 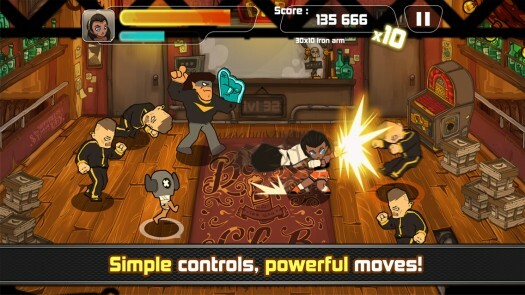 Combo Crew ($1.99) presents its creator’s devotion to beat ’em ups with eminently satisfying panache and a spoonful of camp while, for better or for worse, stripping out one of the central tenants of the genre. It’s a raucous affair that quickly and easily gratifies, but may not constitute a nutritious meal. Rightfully headlining the feature list is the elimination of virtual controls. 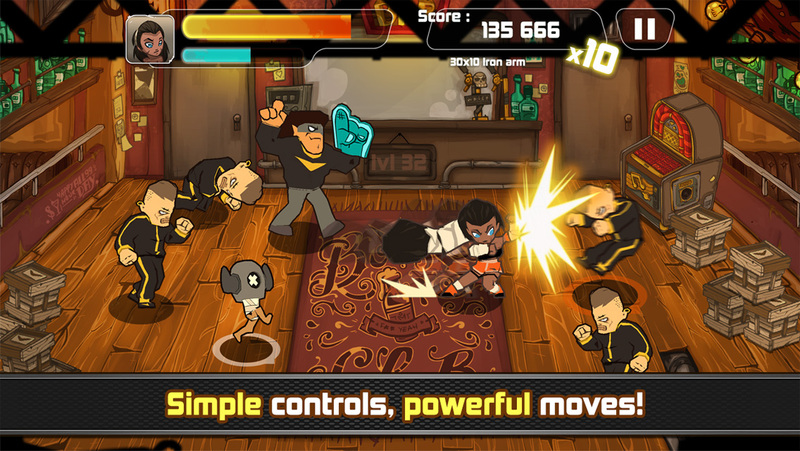 Combo Crew makes no attempt at emulating the stick and buttons iconic of the quarter-sucking, old-school arcade brawler. Instead, the capacitive screen’s unique functionality is utilized to wrap the action in swipes and pokes. Within the confines of a small rectangular arena, targets are chosen with a tap or a single finger swipe attack. Your choice of character swiftly slides to face his or her victim, delivering the blow from an automatically pegged adjacent position. A double finger swipe in one of the cardinal directions initiates whichever combo you’ve slotted, unleashing a flurry of fists, feet, and hair on whomever your attention is vested on while building up a meter for a super attack. Enemies flash an obvious red exclamation point signaling their intentions, a single tap anywhere on the screen schedules a counter for your character’s next free moment. It feels wonderful. Mashing is nonexistent and input responsiveness is tight. Furiously scribbling your finger over enemies to string them into supers is a cathartic release. The 3D models plopped onto 2D backgrounds whirl and jolt with slick animations. A rhythm of combos and counters quickly emerges, all wrapped in satisfyingly impactful feedback. But it breaks down. Combo Crew‘s main attraction ushers in a problem of varying severity, depending on your predilections. Engineering a touch-only game of this sort is certainly a commendable feat, but the automaticity of the scheme limits the extent to which skill may develop. Positioning is handled for you: enemies approach one at a time, and the different opponent types – hell, even the bosses – can be successfully handled with the exact same tactics. This is not a game that rewards mastery. I’d go as far as to say that mastery harms the experience. 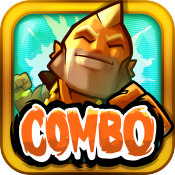 Combo Crew can, quite literally, be played with your eyes closed if you figure things out. Still, it’s great fun for what it is. A light self-aware kung-fu movie corniness accompanies you as you ascend the baddie’s tower, pinballing between and beating the everloving schlamoley out of enemies. Unlike Game of Death, however, the fights on each tier are always the same. Combo Crew is a bowlful of Doritos. Something craveable. Something flavorsome and wonderfully crunchy, but still mostly empty carbohydrates.